After the success of “Komm, süßer Tod”, and given the fact that there were many more Brenner-novels by Wolf Haas who awaited adaptation into a movie, it was only a matter of time until a sequel came along. However, the fact that they took four years to complete it already illustrates that this was far from a rush job. Instead, they took the time to do it right – and they ended up with a movie that far exceeded its predecessor. Back when Wolf Haas wrote his novel, but also when the movie was released, the transgressions of the Austrian clergy – especially when it comes to child abuse – were a hot topic (thanks to accusations that concerned not “just” a simple, regular priest, but rather a cardinal). What I found interesting about “Silentium”, though, is that while child abuse is very much part of this story, it only serves as jumping-off point to set things in motion. The crime that’s at the center of the story, however, is a different one, and somehow – maybe because of the cold, calculated and organized nature of it – I have to say that in a way, I found it even more shocking. Anyway, the crime behind “Komm, süßer Tod” might have been slightly more original and unusual, but I nevertheless prefer the story of “Silentium”. Despite the sometimes bleak nature of some scenes, a sense of (mostly quite dark) humor permeates the movie, further enhanced by the often hilarious dialogue as well as some flat-out gags (like the “North by Northwest”-hommage – the only time that the Brenner movies, so far, ventured into parody-territory – or the great ending to the car chase in the parking garage). Given the rather grim subject matter, this serves as a nice contrast – which, on the other hand, might not be for everyone. On a technical level, “Silentium” wipes the floor with its predecessor. Everything is much more stylized and polished, with no boom mic in sight. Where “Komm, süßer Tod” simply told the story by pretty much putting the camera in front of the actors, but without much style or flair, “Silentium” is shot much better and feels more thought-out. There are a couple of very well made sequences that manage what the first one couldn’t: Enhance the story through its images, the editing, the music, and/or the mood. The difference is so great that it’s actually hard to believe that it’s pretty much the same technical team, including the director of photography, the editor, and or course director Wolfgang Murnberger himself. One strength that they took over from the last one is casting, and the acting performances in general. Josef Hader proves again to be the only choice to play this role. This time, they also give him a worthy antagonist to play against (I won’t say his name, though, since that would be telling). Simon Schwarz again proves to be a great comedic sidekick, even though the way they stumble into each other feels slightly forced. 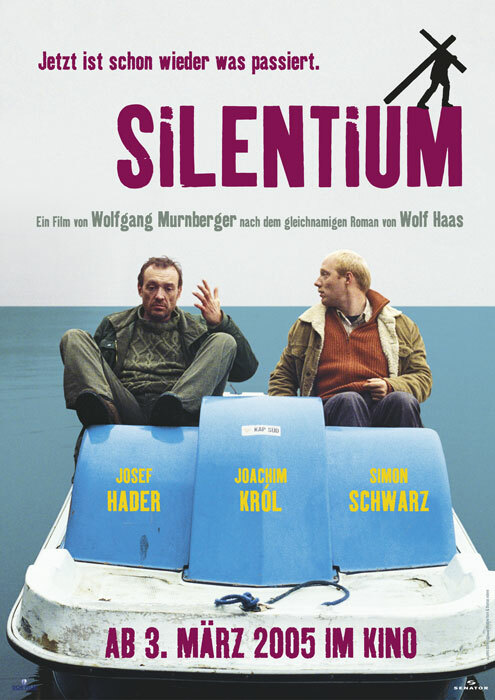 “Silentium” again features a couple of well-known faces from austrian and german cinema and television, including a cameo by theatre-enfant-terrible Christoph Schlingensief, but it’s obvious that they weren’t hunting for big names, and rather looked for the right people for each role. I also really like the setting. Salzburg is a beautiful city, and even though I haven’t visited it quite as often in my life (so far) as I would have liked, it was great so see a couple of well-known and also lesser-known spots. Finally, I absolutely love the ending – however, I can’t really discuss it without venturing into spoiler-territory. “Silentium” is a step up from “Komm, süßer Tod” in each and every way, and until a couple of months ago, it was my favorite of the Brenner movies. “Das ewige Leben” might have dethroned it in that regard, but nevertheless, I still very much enjoy it, and rank it among the best that Austrian cinema has to offer. This entry was posted in austrian cinema, movie reviews and tagged 2004, austria, austrian cinema, Brenner, comedy, crime, Jürgen Tarrach, Joachim Kröl, Josef Hader, Rosie Alvarez, Silentium, Simon Brenner, Simon Schwarz, Udo Samel, Wolf Haas, Wolfgang Murnberger. Bookmark the permalink.